What is a “chytrid”? What is Bd? What is salamander fungus, or Bsal? How does Bd kill amphibians? Do all amphibians infected with Bd die? Can populations with chytridiomycosis recover? Where did Bd come from? What are the signs of chytridiomycosis? How do I keep Bd and chytridiomycosis out of my amphibian collection? Is Bd the greatest threat to amphibians? What is a “chytrid”? What is Bd? A “chytrid” is a type of fungus (Phylum Chytridiomycota) and there are approximately 1,000 different chytrid species that live exclusively in water or moist environments. The chytrids are among the oldest (most primitive) types of fungi and until very recently were considered members of the Kingdom Protista (and therefore thought to be more closely related to single celled organisms like protozoa). Most chytrids are saprobes meaning that they feed on dead and rotting organic matter. Other chytrids are parasites that live on plants or invertebrate animals. In 1999, a new species of chytrid was described that infects the skin of amphibians and was named Batrachochytrium dendrobatidis or “Bd” for short (Longcore et al., 1999). Although the name Batrachochytrium is hard for even many scientists to pronounce, it roughly translates to mean “frog chytrid”. Bd is unusual because it is the only chytrid that is a parasite of a vertebrate animal (amphibians specifically; Bd has not been observed to infect other vertebrates such as reptiles, birds or mammals). Why is Bd Important? Bd is a very important chytrid fungus because it appears to be capable of infecting most of the world’s approximately 6,000 amphibian species and many of those species develop the disease chytridiomycosis which is linked to devastating population declines and species extinctions (Berger et al., 1998; Skerratt et al., 2007; Fisher et al., 2009). In fact, infection with Bd has been called “the worst infectious disease ever recorded among vertebrates in terms of the number of species impacted, and it’s propensity to drive them to extinction (Gascon et al, 2007). Amphibian population declines due to chytridiomycosis can occur very rapidly— sometimes over a just a few weeks (Lips et al., 2006) and disproportionately eliminate species that are rare, specialized and endemic (e.g. those species that are most unique) (Smith et al., 2009). Because of these characteristics—rapid progression of population declines and loss of very important amphibian species—urgent mobilization of efforts to preserve amphibian species are required. What is chytridiomycosis? How does Bd kill amphibians? Chytridiomycosis (“Mycosis” = disease caused by a fungus) is the disease that occurs when an amphibian is infected with large numbers of the Bd fungus. Infection with Bd occurs inside the cells of the outer skin layers that contain large amounts of a protein called “keratin”. Keratin is the material that makes the outside of the skin tough and resistant to injury and is also what hair, feathers and claws are made of. With chytridiomycosis, the skin becomes very thick due to a microscopic change in the skin that pathologists call “hyperplasia and hyperkeratosis”. These changes in the skin are deadly to amphibians because— unlike most other animals— amphibians “drink” water and absorb important salts (electrolytes) like sodium and potassium through the skin and not through the mouth. Abnormal electrolyte levels as the result of Bd-damaged skin cause the heart to stop beating and the death of the animal (Voyles et al., 2009). Other amphibians like the lungless salamanders, use the skin to breathe and skin changes due to chytridiomycosis could interfere with this function causing suffocation. The presence on the skin of specific types of symbiotic bacteria that discourage the growth of Bd (Harris et al., 2009 a and b). Amphibians or amphibian populations that normally have large numbers of these bacteria in the skin might be more resistant to developing chytridiomycosis. The production by the poison glands in amphibian skin of chemicals called “antimicrobial peptides” that discourage the growth of Bd. Specific types, combinations or amounts of antimicrobial peptides might help some species to be more resistant to chytridiomycosis. Some amphibian species or populations may have genetic resistance to the development of chytridiomycosis by mechanisms that are not yet understood. Environmental differences between populations such as temperature, humidity or water flow patterns. For instance, some of the most important amphibian population declines associated with chytridiomycosis have occurred at high elevation locations that have a cool temperature range (< 250C or 770F) that is most optimal for the growth of Bd. Differences in virulence between different types or “strains” of the Bd fungus. The term virulence refers to the ability of the fungus to cause disease in amphibians. A type of Bd that is “highly virulent” easily makes amphibians sick, but another type of Bd that has “low virulence” makes fewer animals sick or results in less severe disease. There is not a single explanation for why an amphibian population succumbs or does not succumb to chytridiomycosis and in most cases multiple factors are probably at work to result in a particular outcome. Can amphibian populations with chytridiomycosis recover? Some amphibian populations experience devastating mass mortality events due to chytridiomycosis where most of the population succumbs to the disease, but a small number of animals remain or “persist” in the population. At this time it is unknown if these “persistent populations” might eventually recover and regain the numbers of animals they had prior to chytridiomycosis or if these populations will remain small or even eventually disappear. Recent research has shown that a critical factor in determining if chytridiomycosis will cause extinction of an amphibian population is if the level of intensity of the infection with Bd crosses a certain threshold (Briggs et al., 2010; Vredenberg et al., 2010). What is very interesting about the “persistent” populations is that the remaining animals are still infected with Bd, but at a lower or less lethal intensity. Like the individual amphibian species that are resistant to chytridiomycosis (see above), understanding why persistent populations maintain low intensity infections with Bd is very important and could lead to methods to control the disease in wild populations. Where is Bd found? Where did Bd come from? Since its discovery, Bd has been found in wild and captive amphibian populations on every amphibian-inhabited continent. It is actively spreading in South, Central, and western North America, as well as the Caribbean, Australia and Europe. Bd is also found in Africa, Asia, and eastern North America, but does not seem to be spreading in these locations. Bd is conspicuously absent from Madagascar, Borneo and New Guinea. Scientists have questioned if Bd is a fungus that has always infected amphibians all over the world and has just now begun to cause disease— because of changes to the environment or suppression of amphibian immune systems—or if Bd has only recently been introduced to new populations of amphibians and causes disease in naïve populations that have not developed a natural resistance to Bd infection (Rachowicz et al., 2005). It is now well-documented for amphibian populations in Central America and the western United States that Bd was not present in the population until the beginning of declines due to chytridiomycosis (Lips et al., 2006; Vredenberg et al., 2010). In other words it appears that Bd was newly introduced to these locations and then caused the population declines. So if Bd has only recently been introduced to new locations, where did it come from? There is genetic and historical evidence that Bd has been present for a long time in Africa (Soto-Azat et al., 2010; Weldon et al., 2004); Japan (Goka et al., 2009) and eastern North America (Garner et al., 2006) and all have been proposed as the possible site of origin. 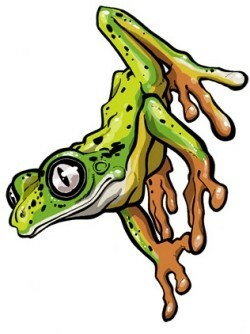 Although the exact origin of Bd has not yet been determined, it has become clear that global trade in amphibians for food, for use as laboratory animals, or for use as pets or display animals is responsible for movement of Bd to locations where it was not previously present (Weldon et al., 2004; Schloegel et al., 2009). This has led to international regulations under the World Organization for Animal Health to require that amphibians be free of Bd infection before international shipment (Schloegel et al, 2010). How does Bd spread? Infection with Bd is transmitted by a form of the fungus called a “zoospore”. The zoospore has a very distinctive appearance with a single flagellum that helps the spore swim through water or moist environments. Zoospores require moisture and cool temperatures and can persist in moist environments for several months (Johnson and Speare, 2003), but do not tolerate conditions that are warm or dry for more than a few hours (Johnson and Speare, 2005). Therefore, the most common and successful ways that Bd zoospores spread from place to place are in water, moist or wet materials (including soil or equipment) or on the skin of infected amphibians. In fact, the most common way that Bd infection spreads between amphibians is from direct contact of an infected animal with an uninfected animal (e.g. during territorial or breeding encounters). In captivity, it is possible to house amphibians infected with Bd in enclosures next to enclosures with amphibians that are not infected with Bd and not transmit the infection as long as animals, water and wet materials and tools are not shared between the enclosures. Guidelines to reduce the transmission of Bd in captive environments are available (Pessier and Mendelson, 2010). In the natural environment, it has been hypothesized that Bd can move on people’s boots or equipment or on birds and invertebrates that fly between watersheds (Johnson and Speare, 2005). Therefore, it is important that biologists and others take precautions to clean and disinfect their boots and equipment before moving from one location that has amphibians to another location in order to minimize the risk of spreading Bd (Phillot et al., 2010). Because many amphibians that are infected with Bd are resistant to the disease chytridiomycosis (see above), they can appear to be outwardly healthy but are still capable of spreading Bd from one location to another. This is important because these animals may act as a reservoir for transmitting Bd infection to other amphibians as part of natural movements between different watersheds. Amphibians can also move Bd to new locations as the result of trade in amphibians (see above) or potentially by the release of captive amphibians to the wild (See Amphibians in Classrooms). What are the signs of chytridiomycosis? An amphibian that is sick with chytridiomycosis can have a wide variety of symptoms or “clinical signs”. Some of the most common signs are reddened or otherwise discolored skin, excessive shedding of skin, abnormal postures such as a preference for keeping the skin of the belly away from the ground, unnatural behaviors such as a nocturnal species that suddenly becomes active during the day, or seizures. Many of these signs are said to be “non-specific” and many different amphibian diseases have signs that overlap with those of chytridiomycosis. In addition, other cases of chytridiomycosis will not show any of these signs and amphibians will simply be found dead. For these reasons it is not possible to diagnose chytridiomycosis with the naked eye and laboratory testing is required (see How is Chytridiomycosis Diagnosed? below). Center for Wildlife Disease University of South Dakota Biology Department 414 E. Clark Street Vermillion, SD 57069 USAContact: Jake Kerby, Ph.D. Assistant ProfessorPhone: (605) 677-6170 Fax: (605) 677-6557 Email: Jacob.Kerby@usd.edu The Swiss company Ecogenics (www.ecogenics.ch; info@ecogenics.ch) offers commercially a PCR-based test for the detection of chytrid fungus from amphibian tissue samples and non-invasive swabs. The test is the real-time PCR test developed by Boyle et al. (2005, Diseases of Aquatic Organisms 60: 141-148). Please contact Ecogenics directly for pricing and further details. Establishment of the test by Ecogenics was financed by the Swiss federal office for the environment through a contract with KARCH. PCR requires a molecular biology laboratory that uses rigorous controls for positive and negative samples and that has carefully validated the PCR test. A disadvantage of PCR is that it is not able to distinguish between amphibians that are sick with chytridiomycosis and amphibians that are carriers of Bd, because both types of animals will test “positive” by PCR. Can chytridiomycosis be treated? In captive amphibians, chytridiomycosis can be successfully treated with antifungal medications and by disinfection of contaminated enclosures (Pessier and Mendelson, 2010). A variety of different antifungal medications have been described for the treatment of chytridiomycosis, however, one of the most common methods was developed at the Smithsonian National Zoo and uses a series of baths in the drug itraconazole (Nichols and Lamirande, 2000). Itraconazole baths have been used successfully in rescue operations that capture wild amphibians from populations that are experiencing deaths to chytridiomycosis (Gagliardo et al., 2008). Other potential treatment methods include the use of elevated body temperature and paradoxically, the antibiotic chloramphenicol. Treatment is not always 100% successful and not all amphibians tolerate treatment very well, therefore chytridiomycosis should always be treated with the advice of a veterinarian. Unfortunately, there are no good methods for the treatment of wild animals in the natural environment. It is very difficult or impossible to get enough of the antifungal medications into the environment to be able to successfully rid infected frogs of Bd. In the future it may be possible to treat some amphibians in the wild in order to reduce the intensity of infection to a less lethal level with the hope that animals could survive with a mild Bd infection (Briggs et al., 2010; Vrendenberg et al., 2010). Another promising area of research is looking at the possibility of introducing symbiotic bacteria that inhibit the growth of Bd into wild amphibian populations (Harris et al., 2009). So far, there is no evidence that a vaccine for chytridiomycosis could be effective for controlling the disease in wild populations (Stice and Briggs, 2010). Quarantine of new amphibians before they enter an established amphibian collection. New animals are kept separate from the established collection for a period of time (usually 60-90 days) to allow for observation for signs of disease and to perform laboratory testing for diseases such as Bd. Testing or treating animals for Bd infection during the quarantine period. Perform surveillance for Bd infection in your amphibian collection. This is done by regular necropsies (autopsies) of animals that die and by PCR testing of collection animals. Many amphibian collections have Bd infected frogs and don’t know it. Develop “specific pathogen free” amphibian populations that are known to be free of Bd infection. If all captive raised amphibians can be certified as Bd-free it will simplify quarantine and amphibian shipment practices for everyone. Practice good hygiene and barrier management between animal rooms and displays. Use separate equipment and disposable gloves between enclosures and dispose of wastes and waste water responsibly. If Bd is identified in your amphibian collection: DON’T PANIC. 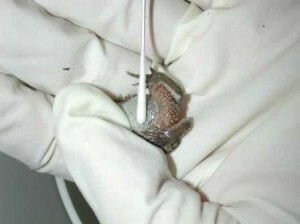 Bd infection is common in captive amphibians and there are effective treatment methods available (see above). Use outbreaks of chytridiomycosis in collection as an opportunity to make your animals healthier by screening the collection for unsuspected carriers of Bd infection; treating infected animals and reviewing protocols for controlling the spread of infectious diseases in the collection. Detailed methods for amphibian quarantine and the treatment and control of Bd infection can be found in Pessier and Mendelson, 2010. Is Bd the greatest threat to amphibians? No. Habitat loss affects more amphibian species than any other threat by nearly a factor of 4. However, while habitat loss proceeds at a steady pace, Bd can often work quickly. The IUCN has called amphibian chytridiomycosis “the worst infectious disease ever recorded among vertebrates in terms of the number of species impacted, and its propensity to drive them to extinction.” And because the Amphibian Ark focuses on species facing threats that cannot currently be mitigated in the wild, such as Bd, we necessarily focus largely on this disease and leave the mitigable threats, such as habitat loss, to our ASA partners specializing in those areas. Developing a safe antifungal treatment protocol to eliminate Batrachochytrium dendrobatidis from amphibians – A. MARTEL, P. VAN ROOIJ, G. VERCAUTEREN, K. BAERT, L. VAN WAEYENBERGHE, P. DEBACKER, T. W. J. GARNER, T. WOELTJES, R. DUCATELLE, F. HAESEBROUCK & F. PASMANS Murray, K., Skerratt, L., Marantelli, G., Berger, L., Hunter, D., Mahony, M. and Hines, H. 2011. Guidelines for minimising disease risks associated with captive breeding, raising and restocking programs for Australian frogs. A report for the Australian Government Department of Sustainability, Environment, Water, Population and Communities. Fisher, M.C., T. W. J. Garner, and S. F. Walker. 2009. Global emergence of Batrachochytrium dendrobatidis and amphibian chytridiomycosis in space, time, and host. Annual Review of Microbiology 63:291–310. Kilpatrick A.M., C.J. Briggs, and P. Daszak. 2009. The ecology and impact of chytridiomycosis: an emerging disease of amphibians. Trends in Ecology & Evolution online. Rosenblum, E. B., J. Voyles, T. J. Poorten, and J. E. Stajich. The deadly chytrid fungus: a story of an emerging pathogen. PLoS Pathogens 6: e1000550. A guide to husbandry and biosecurity standards required for the safe and responsible management of ex situ populations of amphibians These standards are based upon those reported in the proceedings of the CBSG/WAZA Amphibian Ex situ Conservation Planning Workshop, El Valle, Panama, 12-15th February 2006. Berger, L., R. Speare, P Dazsak, D.E. Green, A.A. Cunningham, C.L. Goggin, R. Slocombe, M.A. Ragan, A.D. Hyatt, K.R. McDonald, H.B. Hines, K.R. Lips, G. Marantelli and H. Parkes . 1998. Chytridiomycosis causes amphibian mortality associated with population declines in the rain forests of Australia and Central America. Proceedings of the National Academy of Sciences of the United States of America 95: 9031-9036. Fisher, M.C., T.W.J. Garner, and S.F. Walker. 2009. Global emergence of Batrachochytrium dendrobatidis and amphibian chytridiomycosis in space, time, and host. Annual Review of Microbiology 63:291–310. Gagliardo, R., P.Crump , E. Griffith,et al. 2008. The principles of rapid response for amphibian conservation using the programmes in Panama as an example, International Zoo Yearbook 42: 125-135. Garner T.W.J., M. Perkins, P. Govindarajulu, D. Seglie, S.J. Walker, A.A. Cunningham, and M.C. Fisher. 2006. The emerging amphibian pathogen Batrachochytrium dendrobatidis globally infects introduced populations of the North American bullfrog, Rana catesbeiana. Biol. Letters 2:455-459. Gascon C., J.P. Collins, R.D. Moore et al., editors: Amphibian Conservation Action Plan. IUCN/SSC Amphibian Specialist Group. Gland, Switzerland and Cambridge UK, 2007. Goka K, J. Yokoyama, Y. Une, T. Kuroki, K. Suzuki, M. Nakahara, A. Kobayashi, S. Inaba, T. Mizutani, and A.D. Hyatt. 2009. Amphibian chytridiomycosis in Japan: distribution, haplotypes and possible route of entry into Japan. Molecular. Ecology. 18:4757-4774. Harris R.N., R.M. Brucker, J.B. Walke et al. 2009a. Skin microbes on frogs prevent morbidity and mortality caused by a lethal skin fungus, ISME J 3: 818-824. Harris, R.N., A. Lauer, M.A. Simon, J.L. Banning, and R.A. Alford. 2009b. Addition of antifungal skin bacteria to salamanders ameliorates the effects of chytridiomycosis. Diseases of Aquatic Organisms 83:11-16. Hyatt, A.D., DG Boyle, Olsen V et al. 2007. Diagnostic assays and sampling protocols for the detection of Batrachochytrium dendrobatidis, Diseases of Aquatic Organisms 73: 175–192. Johnson, M.L., R. Speare. 2003. Survival of Batrachochytrium dendrobatidis in water: Quarantine and disease control implications, Emerging Infectious Diseases 9: 922-925. Johnson, M.L., R. Speare. 2005. Possible modes of dissemination of the amphibian chytrid Batrachochytrium dendrobatidis in the environment, Diseases of Aquatic Organisms 65:181-186. Lips, K.R., F. Brem, R. Brenes, J.D. Reeve, R.A. Alford, J. Voyles, C. Carey, L. Livo, A.P. Pessier, and J.P. Collins. 2006. Emerging infectious disease and the loss of biodiversity in a Neotropical amphibian community. Proceedings of the National Academy of Sciences of the United States of America 103:3165-3170. Longcore, J.E., A.P. Pessier and D.K. Nichols. 1999. Batrachochytrium dendrobatidis gen. et sp. nov., a chytrid pathogenic to amphibians. Mycologia 91:219-227. Pessier, A.P. and J.R. Mendelson (eds.). 2010. A Manual for Control of Infectious Diseases in Amphibian Survival Assurance Colonies and Reintroduction Programs. IUCN/SSC Conservation Breeding Specialist Group: Apple Valley, MN. Murray, K.A., L.F. Skerratt, R. Speare, and H. McCallum. 2009. Impact and dynamics of disease in species threatened by the amphibian chytrid fungus, Batrachochytrium dendrobatidis. Conservation Biology:23:1242-52. Rachowicz, L.J., J. Hero, R.A. Alford, J.W. Taylor, J.A.T. Morgan, V.T. Vrendenberg, J.P. Collins, & C.J. Briggs. 2005. The novel and endemic pathogen hypotheses: Competing explanations for the origin of emerging infectious diseases of wildlife. Conservation Biology 19: 1441-1448. Schloegel, L.M., A.M. Picco, A.M. Kilpatrick, A.J. Davies, A.D. Hyatt, and P. Daszak. 2009. Magnitude of the US trade in amphibians and the presence of Batrachochytrium dendrobatidis and Ranavirus infection in imported North American bullfrogs (Rana catesbeiana). Biological Conservation 142:1420-1426. Skerratt, L.F., L. Berger, R. Speare, S. Cashins, K.R. Mcdonald, A. Phillott, H.Hines, and N. Kenyon. 2007. Spread of chytridiomycosis has caused the rapid global decline and extinction of frogs. EcoHealth 4:125-134. Soto-Azat, C., B.T. Clarke, J.C. Poynton, and A.C. Cunningham. 2010. Widespread historical presence of Batrachochytrium dendrobatidis in African pipid frogs. Diversity and Distributions 16:126-131. Stice, M.J., C.J. Briggs. 2010. Immununization is ineffective against preventing infection and mortality due to the amphibian chytrid fungus Batrachochytrium dendrobatidis. Journal of Wildlife Diseases 46: 70-77. Voyles, J., S. Young, L. Berger, C. Campbell, W.F. Voyles, A. Dinudom, D. Cook, R. Webb, R.A. Alford, L.F. Skerratt, and R. Speare. 2009. Pathogenesis of chytridiomycosis, a cause of catastrophic amphibian declines. Science 326:582-585. 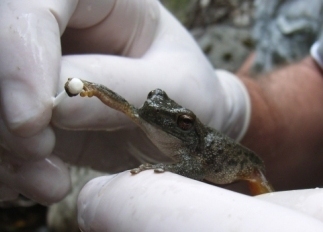 The Wildlife Disease Laboratories of the Institute for Conservation Research at the San Diego Zoo are pleased to be able to offer low-cost testing for the amphibian chytrid fungus (Batrachochytrium dendrobatidis) and Ranaviruses. The testing is subsidized by an Institute of Museum and Library Services (IMLS) National Leadership grant “Infectious Disease Control and Bioresource Banking for the Amphibian Extinction Crisis” awarded to the Zoological Society of San Diego and Zoo Atlanta. The goal of the subsidized testing is to encourage widespread surveillance of zoo collections for these potentially population-limiting infectious diseases. Hopefully, these efforts will facilitate eradication of chytrid fungal infections from established zoo collections and enable the collection of data of the occurrence and prevalence of these diseases that is needed to make use of disease risk assessment tools for reintroduction programs. The laboratory is also able to provide assistance in working up outbreaks of infectious diseases in captive collections (especially molecular diagnostic testing) working together with your facility veterinarian and pathologist.